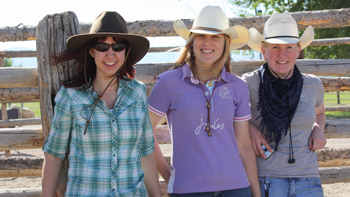 This clinic is at the Lonesome Spur Ranch (www.lonesomespurranch.com) is designed to establish trust and respect with an Lonesome Spur Ranch Clinicequine partner, while enjoying yourself. The riding exercises are practical and instill confidence in each rider’s abilities. Equine psychology, Ground work, Focused riding, Handling spooky situations, Rein management, and Lead changes are some of the areas that will be covered. Dixon Stables Observation clinics are designed for people to get to know Marc and his philosophies. We offer these at Dixon Stables on a regular basis. At these one day clinics we usually start an untouched colt, and carry it through the first ride. We furnish lunch and then, whatever the theme is of that clinic, we will continue to give you some insight on the training philosophies that have helped so many people build a partnership with their horse. Please watch website for information on coming dates. Dixon Stables Participation clinics are designed for participants to learn how to properly educate their horse to gain softness, control, and respect with gentle and non-abusive techniques. These philosophies will in turn produce a high quality horse which will make the horse partnership a more enjoyable one. 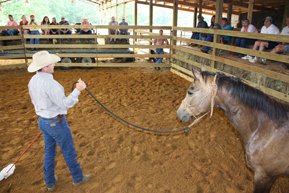 In these two, three or six day clinics the participants will ride their own horse and/or a finished horse that will be supplied by Marc, sometimes its hard to teach your horse some maneuvers until you can feel it. Marc will travel to conduct a clinic for at least eight participants with a limit of fifteen. Observers are welcomed and encouraged. Clinics can also be conducted at Dixon Stables. The host of the clinic shall determine what type of clinic they would like conducted. Types of clinics include: ground control, basic under saddle, advanced under saddle, problem solving, etc. The clinic host may participate in the clinic at no cost as long as the minimum number of eight other required participants is met. Please call or email for clinic pricing.